I haven't seen Dr. No-Share in quite some time, but in reality, I see him every half-year because he is my dentist. Beyond that, we used to eat out often since he was on my softball team. But it has been years since we sat down and had a meal. 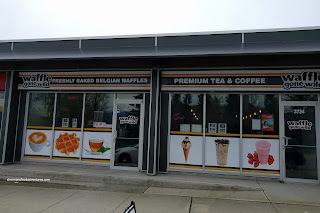 Over a year ago, he wanted me to try a place in Kits called Waffle Gone Wild. However, we never got around to it. 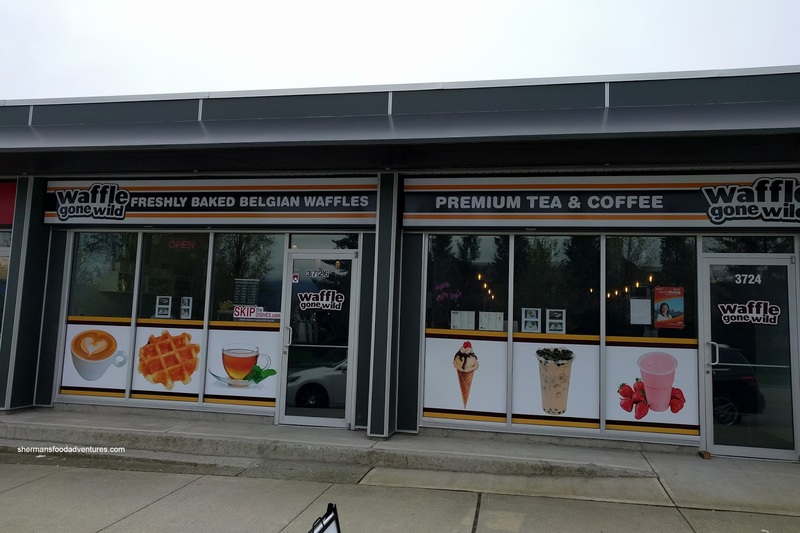 In fact, it has since closed that location and moved into their new digs on Canada Way near Boundary. Finally, we made it out for some brunch a few weeks ago. Our plan of attack was to order one waffle from each of their categories starting with the Maple Bacon with cheddar cheese, mixed greens and balsamic vinegar. 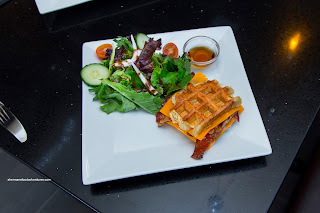 Although advertised as bacon bits on the menu, what we actually found was crispy strips of lean bacon sandwiched in between 2 slices of cheddar inside a waffle sandwich. The waffles were a bit lighter and less sweet than other liege waffles I've had, but they were still soft and aromatic with a pleasant chewiness. This "sandwich" was pretty tasty. 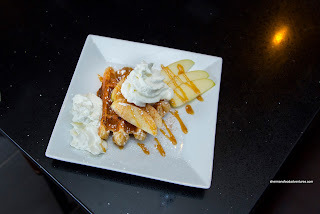 From savoury we went with sweet in the Apple Blossom with freshly cut apple slices, cinnamon and caramel sauce. Again the waffles were light and mildly sweet where the caramel sauce did the heavy lifting in terms of the sugar content. It wasn't aggressively sauced, so the whole thing still had some tang from the apples and impact from the cinnamon. 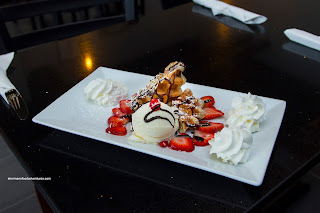 Lastly, we had the Strawberry Heaven Deluxe with dark chocolate sauce, coconut waffle, vanilla ice cream and whipped cream. From the picture, I was expecting a large serving, but it was ultimately as small as the apple blossom. Despite this, it was still quite good with a balanced amount of ingredients. Overall, from the 3 items we tried, Waffle Gone Wild provided a pleasant experience in a location where waffles aren't normally found.